2018 has been the hottest year on record and i don’t recall a drier summer. 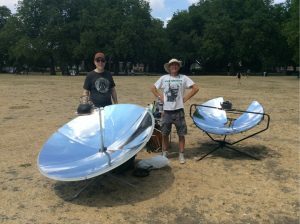 Great weather for a solar cooker and our plan remains to get them into view by any limited means possible, . 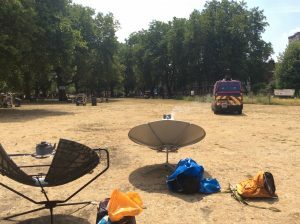 The smokey barbecue spot at London Fields is heaving on a weekend afternoon, full of media movers and shakers. Great place to demo clean cooking. Well maybe….. Despite spending at least five minutes planning our hit, we didn’t realise that lighting up was now banned by order of the Fire Brigade, due to fire risk. We learnt this when the parkies showed. ‘What are you doing’ (looking behind for fire) ‘you can’t light these you know’ (still scratching head) ‘better call my boss’. Boss park keeper was Jamaican and got it straight away. 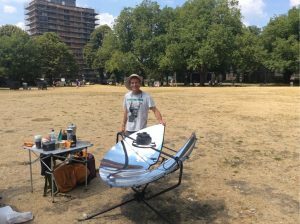 Concentrated heat from the sun?…no problem! Then the law enforcement appeared. They prevent petty crime amongst the revellers. But this was a slow day….we made them a cup of tea. 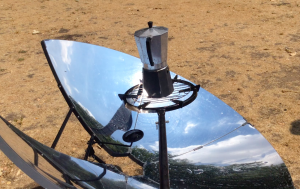 We wanted to confirm if a portable solar cooker could provide a half decent barista coffee experience, with hot tea catering on sunny days. Pitching up like one of those coffee trikes, but without the fossil fuel use. Low impact for the hipsters. Luckily the crowd wasn’t so huge and didn’t smoke us out. We could test run without much pressure. Clear July sun the whole time. We handed out tea and stovetop cappuccino, hot frothed milk made with a hand whizzer. Did it work? absolutely yes, on a hot day you can create pretty decent coffee. It takes a bit more work – you’re not just flipping a switch. When some Italians passed by and we offered them cappuccino, they accepted. Despite not having the slightest commercial aspect to the stand one of them gave me £2 for it. Well that was better than any words of praise. Italians know about coffee. Starbucks, watch your back! Look how yellow the turf was, like a desert and in future I’ll need a parasol. But imagine if some kids or students ran with the idea? 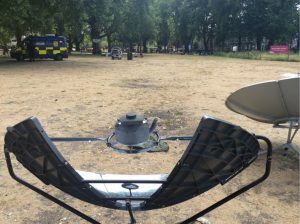 With a mobile solar coffee stand they could undercut the fossil fuel caterers on a beach, in parks and riversides, away from roads Places where fires aren’t allowed. 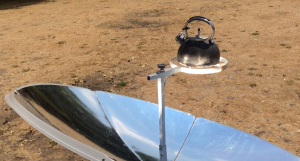 If offered a choice , I’d buy low impact solar fuel hot drinks all day long. 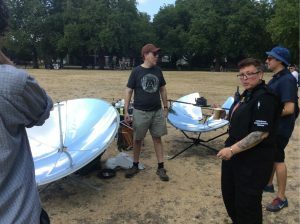 Solar cookers were: a SolSource Classic and a Generic Chinese parabolic, each developing 1kW focused cooking power. This entry was posted in Ecozoom UK on December 3, 2018 by ecozoomuk.